Cox added that he was amazed how his 17 students — most biochemistry majors but some from other fields researching in department labs — made up 8% of the 225 students participating but took home 15% of the 20 prizes. In four categories, one top prize is given, along with four honorable mentions. Andrew DeLaitsch from the Butcher Lab took the top prize in the “DNA, RNA, chromosomes and gene regulation” category, earning a $500 prize. Sam Block, of the Audhya Lab in the Department of Biomolecular Chemistry, and Stephen Early, of the Kiessling Lab, both brought home honorable mentions in their categories. From left to right, back row: Matt Schneider (Maeda Lab), Sam Block (Audhya), Evan Heiderscheit (Ansari), Laura Sowin (Cox), Hannah Poe (Hoskins), Stephen Early (Kiessling), Maeve McDermott (Dent), Gabriel Epstein, Andrew Delaitsch (Butcher), Patrick Sadecky (Kiessling), Matt Ritger (Cox); Front row: Hannah Mast (Hoskins), Mike Drahnak (Pagliarini), Arthur Clark (Hoskins), Nick Yan (Craig), Runyu Hong (Record), and Lili Kim (Kiessling). Photo by Mike Cox. 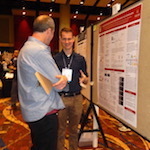 DeLaitsch’s poster was titled “Structural and Biochemical Characterization of the U6 Biogenesis Protein Usb1.” The Usb1 protein is an important component of how genes are expressed, and he presented on the structure of it, as well as discussed how he is mutating different parts of the enzyme to figure out how it works. Some students on campus are involved in the ASBMB student chapter, which serves as a resource for students wanting to get involved in research and get the most out of their education in biochemistry or related fields.